The Fairlane range of cars produced by Ford of Australia were perhaps the most successful that the company produced, totally dominating the local luxury car market for years. Prior to its release, buyers had a choice between the smaller Falcon, or buying imported and rhd converted versions of the U.S. Galaxy or Custom line. With the introduction of the Fairlane, Ford pitched into the medium sized market, and by a combination of clever design allowing the use of many components from the Falcon and very successful marketing, helped considerably by its initial lack of any competition, the Fairlane grabbed the sales lead and never looked back. 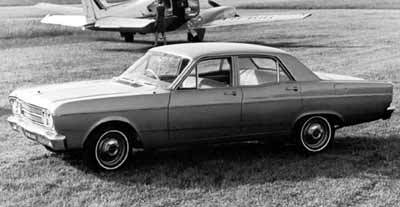 Through the years, the various models of Fairlane followed the Falcon onto the market, changing when the Falcon did, and using their own unique two letter code to distinguish the cars. The ZA closely followed the XR Falcon onto the market, and used many of the smaller car’s components, not just drivetrain and suspension, but even the doors were the same. The rear wings were extended and raised sufficiently differentiating it from the XR and creating the big car look that Ford wanted. The ZA was manufactured between March, 1967 and March 1968. Minor revisons to the front and rear styling marked the ZB. The tail lamp treatment was altered, retaining the large square Galaxie style lamp but bisected now by a rectangular indicator lens, replacing the central circular one. The optional V8 changed too, increasing in size form 289ci to 302ci. The range retained its two trim levels, Custom and upscale 500. The ZB was manufactured between March, 1968 and July, 1969. The ZC marked the first noticable change to the Fairlane, swapping from horizontal to vertical headlamp orientation. For long a U.S. styling device, it was unusual that Ford in Australia would go to this design after it had been abandoned across the Pacific. By necessity it did raise the front wings to accomodate the lights and this gave the ZC a larger and more imposing look. For the first time a 351ci V8 was available for the Fairlane. The ZC was manufactured between July, 1969 and November, 1970. There were minor styling changes to the ZD, the grille became bolder and the tail lamps were changed and separated by a broad trim panel. While the car had not altered much in style, it retained its grip on the market place, despite the appearance of locally produced rivals. The ZD was manufactured between November, 1970 and March, 1972. 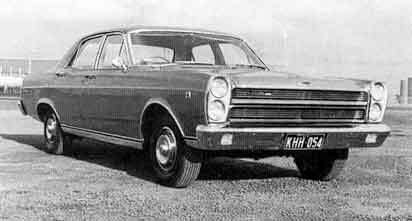 The ZF marked a complete new re-styling of the Fairlane, now wholly Australian designed and produced. 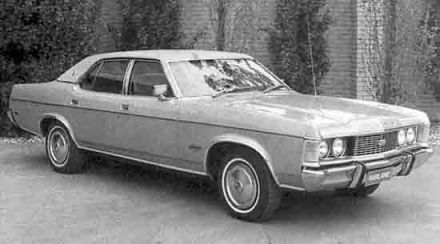 It is easy to see that the design was influenced by the new XA Falcon, retaining, as the previous cars had done, the basic central structure including the doors, and bulking out either end. The bold grille and unique tail lamps helped, but there was a feeling that it did not differentiate itself enough from its smaller Ford contemporary. The ZF was manufactured between March, 1972 and October, 1973. The ZG marked yet another gentle revision of its predecessor with a bolder, four horizontal bar grille and tail lamp tweaks. Engine choice remained between a 250ci(4.1litre) six, or a 302ci(4.9litre) or 351ci(5.8litre) V8. While revisions to the equivalent XB Falcon gave it a new, modern look, there was growing concern that the Fairlane was still too closely associated in looks with the cheaper Falcon. The ZG was manufactured between November, 1973 and May, 1976. The ZH was Ford’s answer to all the citiscism of its predecessors. While again retaining the central structure of the XC Falcon, the designers put much extra bulk into the car, not only giving it a big car look, but also actually lengthening it as well. The front end was bold and imposing and the redesigned XC rear doors with a lower upsweep removed the previous coke bottle style and allowed not only a more airy interior feel, but gave the car a modern, square shouldered look. The ZH was manufactured between May, 1976 and May, 1979.